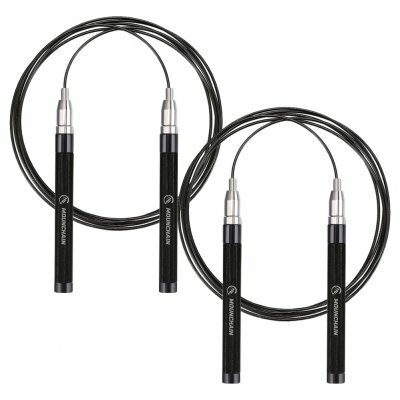 Successfully Added 2 Packed Lightweight With Aluminum Handle Two Cables Jump Rope to your Shopping Cart. SELF LOCKING DESIGN: Built in with double bearing system, no more screws or ties needed, making the jump rope looks simple while convenient than other ropes. ANTI-SLIP HANDLE: Aluminum alloy material made handles with non-slip grains making them not easy to fall and easy to be cleaned; Fit most hand sizes. EASY INSTALL&ADJUST: Press the elastic button and insert the rope, adjust the rope to find the most perfect length for you in seconds, no more other installation steps; Adjustable Length: 10cm/3.94in. INFORMATIONS: Rope Length: 3m/9.84ft, Handle Length: 17cm/6.69in, suitable for most adults and kids. WIDE APPLICATION: A perfect choice for fitness training, body building, daily exercising, cardio exercising both outdoors and in home. - 360 degrees rotating ball bearing ensures rapid rotations and comfortable experiences. - The PVC coated cables are smooth, durable and lightweight to be used. - Packed with a nylon carrying bag which allows bringing the jump rope with you anywhere anytime. - Providing an extra replacement cable for free.